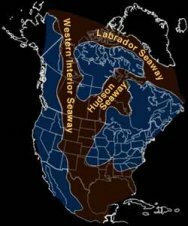 During most of the upper Cretaceous period, the Western Interior portion of North America was covered by a large, shallow (some 100 to 300 meters of maximal depth), epicontinental seaway. This vast seaway stretched from the Gulf of Mexico all the way to the Arctic Ocean. It was during the late Maastrichtian stage that the Fox Hills Seaway retreated, leaving the Fox Hills formation. During the Late Cretaceous, fluctuations in the sea level led to various bouts of exposure of some regions. As a result, there is today some inter-tonguing of terrestrial deposits, the most famous of which is the Hell Creek Formation, home of T. rex. The famous and younger Hell Creek Formation overlies the Fox Hills Formation in Montanaand, and is the youngest formation of the Cretaceous period in this western region. The formation dates to approximately 69 to 70 million years old. Fox Hills Formation exposures occur in south-central and southwestern North Dakota, and mostly comprise sandstones and siltstones that were deposited in shallow marine and lagoon environments. The fossil biota is enormously diverse. Including plant, cartilaginous and ray-finned fishes, land and aquatic reptiles (turtles, crocs, salamanders, mosasaurs), and dinosaurs , including Troodon formosus, the Dromaeosaurid Struthiomimus, Nodosaurids, Hadrosaurids like Edmontosaurus, and Ceratopsids like Triceratops. The vertebrates from the formation, however, are mainly known from teeth and other bones, with complete or nearly complete fossils rarely found. Despite the faunal diversity, the Fox Hills Formation is most famous for incredibly beautiful ammonoid fossils. The high degree of preservation of their natural mother-of-pearl shell makes them appear to be preserved as opal, often called ammolite. This is a consequence of light passing through the various layers of aragonite and conchiolin deposited by the ammonite in life. Conchiolin is secreted by various other mollusks, including oysters, and is a complex protein. The chemical composition of ammolite is variable, depending on the chemical composition of the sea water at the time of deposition. Besides aragonite, calcite, silica, pyrite, or other minerals. The shell itself may contain a number of trace elements, including: aluminium; barium; chromium; copper; iron; magnesium; manganese; strontium; titanium; and vanadium could be present. Ammolite, like pearls are considered biogenic gemstone, and can exhibite a rainbow of collors that varies with angle perspective. Fox Hills Formation ammonoids normally occur in concretions, which are cracked to reveal the ammonoids (and other sea life such as bivalves). Modern-day cephalopods are known to come together for mating, only to die soon thereafter. 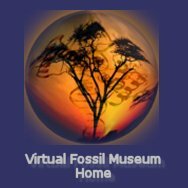 This seems to be the reason that Fox Hills’ concretions often contains a death assemblage of ammonoids, testament to the fact that they mated together and then died together.